The problem of metal theft seems to know no bounds and many outdoor sites really do need to shore up their perimeter security. Our report last year on electrical substation security is a good example. Copper pipes and wiring are usually the target of this kind of metal theft but today we discuss a type that does not happen often – iron age coins! Canterbury in England is world-famous for its historic Cathedral and the whole area has tremendous archaeological importance. Many important finds have been made over the years and the Canterbury Archaeological Trust undertakes the area’s excavations and artefact/site preservations. Some of the artefacts preserved by the Trust are kept in nearby warehousing and during a spate of copper thefts in January thieves targeted the warehouse for some reason. They smashed through a wall and ransacked the warehouse but found no copper piping or wiring. 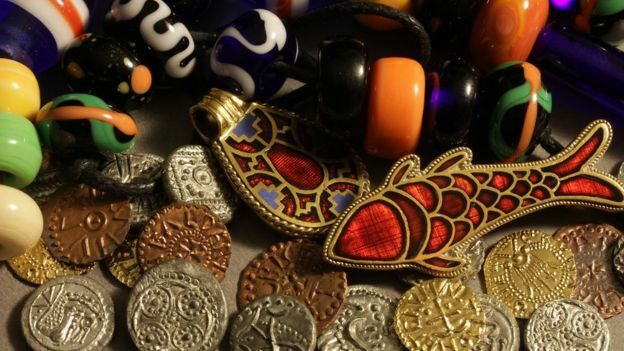 However, rather than leave empty-handed, they stole replica metal axes and pins as well as hundreds of Anglo-Saxon beads and iron age coins under the care of the Trust. Some of the artefacts date back to the Paleolithic period (2.5 millions years ago). It makes no sense that copper thieves would actually target this kind of historic artefact as they would have no ready outlet for realising their value. So an ‘accidental’ theft is the current theory. Read more here. This kind of theft brings home the importance of having an effective warehouse security system. Any perimeter security system must be under regular review both from a point of view of maintenance and regarding current trends of theft and levels of local crime. Our Flexiguard™ perimeter detection system is not only effective but incredibly versatile. It can be installed onto a perimeter fence, on the roof and walls of a building, it can protect skylights, doors and even the inside of warehouse cages. Amongst the many warehouse installations of Flexiguard™ done over the years, we are privileged to have clients such as Next (UK) and Carlsberg (Denmark). So if your warehouse has important contents be sure to review your security system and building maintenance on a regular basis. If you would like us to quote for improving your warehouse security just contact us for a no-obligation discussion. We will be delighted to help you safeguard your precious contents.